A former pro-hockey player injured a little over a year ago, Denna Laing is proving to the world that hockey players really are some of the toughest people in the world. Not letting her injury keep her down, she’s impressed the world with her fierce attitude in rehab, and even the Christopher & Dana Reeve Foundation has taken notice. Awarded the Dana Reeve Hope Award last month, Denna’s spirit is profound for someone so newly injured. Read on to see how despite her severe diagnosis, she’s proving there’s always room for hope. At 25 years old, Denna’s fearless attitude has been a part of her personality ever since she was a little girl. Growing up in a hockey family, with her dad and sisters all playing hockey too, she learned to skate towards her fears and to never back down from a challenge. Injured while playing for the Boston Pride, a NHL women’s hockey team, she fell after the first period. In addition to not being able to walk, her left arm is now stronger than her right, which has forced her to become a lefty. Denna is determined to put as much effort as she can into rehab. Losing the ability to play hockey like she used to however will certainly be an adjustment. Playing hockey since she was a little girl, Denna played hockey in high school at Nobles & Greenough School in Dedham, MA, graduating in 2011. After high school, she was off to attend Princeton University and play on their women’s hockey team. At Princeton, she was the captain of the team during the last two years she played, and frequently managed to get hat-tricks. A forward with an aggressive edge, Denna was a player you knew you to not mess with. After college, she played for C.W.H.L.’s Boston Blades in 2014, and then signed as a practice squad member for the Boston Pride in 2015, the team’s inaugural season. When a few of the team players who were also on the national team had to leave for training, Denna was called up. This was also when the team was invited to play in the Outdoor Women’s Classic on New Year’s Eve 2016; a historical game in that it was the first outdoor women’s pro-hockey game sanctioned by the NHL. Unfortunately, this was also the game Denna was injured. She broke her C4-6 vertebrae in a collision at the end of the second period, and was diagnosed with severe spinal cord injury. Regardless of her unknown recovery prospects, she has shown an impressive strength that has inspired thousands following her around the globe. She went to Spalding Rehab for several months, and now attends Journey Forward, an activity-based rehab center in Boston. Denna’s upbeat spirit garnered the attention of the Christopher & Dana Reeve Foundation recently, who were searching for people to give their annual Dana Reeve Hope award. After reading an article on her tough attitude and tireless efforts towards in rehab, written by NHL writer Amalie Benjamin (read here https://www.nhl.com/news/denna-laing-stays-positive-in-recovery-from-spinal-injury/c-281676522), they selected her as their 2016 recipient. Denna has also quickly become an advocate for people with spinal cord injuries, helping make her the perfect person to be honored as well. Retired from the sport she loves, Denna is focusing on her career plans that were already in movement before injury – The Law. Right before her injury, she was working as a victim witness advocate for the district attorney’s office in Essex County, Mass (while also applying/interviewing at various law schools at the time). Denna is focused more so then ever on becoming a lawyer, and is planning on returning back to school this year. A woman never afraid to have a grandiose life plan, she is still the same fighter as she’s always been and we love her for it. 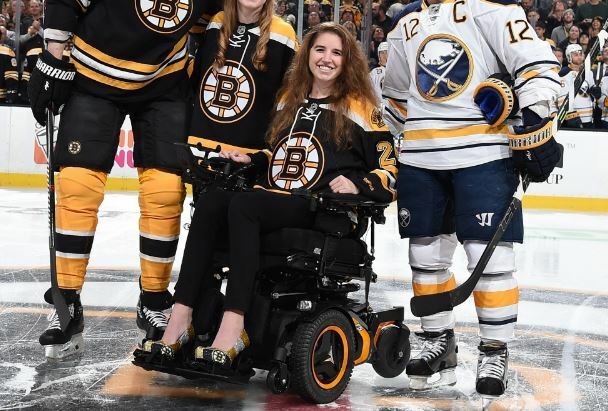 This entry was posted in SCI Superstars and tagged boston pride, denna laing, hockey spinal cord injury, women's hockey, women's NHL on January 9, 2017 by Tiffiny.